An annual ban which makes many of Cornwall's beaches "no-go" areas for dogs, comes into force on Sunday. The 58 beaches are restricted by local authorities from Easter Sunday until the end of October for health reasons and to protect their blue flag status. 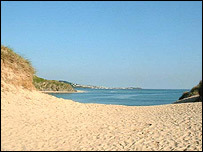 Porthtowan beach near Truro and Falmouth's Gyllyngvase beach are included in the ban. Fistral, Perranporth and Widemouth Bay are some of the 84 beaches which remain open to dogs. But officials are asking owners to act responsibly and clean up after their animals. On Saturday more than 100 dogs were walked across Porthtowan beach in protest at the ban, with owners calling for a split-beach policy. But Carrick District Council has said it has a duty to enforce the bye-law as a means of preventing infection from dog faeces.